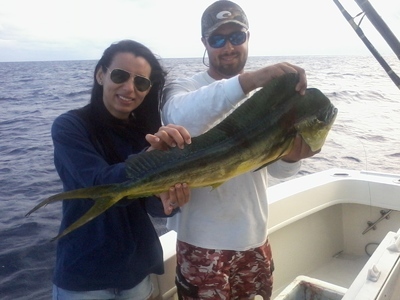 As you can see by the Mahi-Mahi in the photo with his captor Dounia (and 1st mate Brian) there are some decent sized Mahi available on our Ft. Lauderdale fishing charters. They continue to be scattered just off the reef line to roughly 700 feet of water and there continue to be tough fishing days mixed in with the better ones. This particular fish came out of 620 feet of water. As always look for the Hawks and Gulls, with fleeing Flying Fish a pinpoint locator. Sailfishing continues to be slow with few fish in the area for now. The current keeps flopping back and forth from North and South and then back again and that is far from a desirable circumstance. The water clarity has been good, really good, but the current has been a killer on many days. Bottom fishing has been pretty good with Golden Tilefish being the best bet. Gray tiles are small and that bite has been off. Vermillion Snappers are ravenous but undersized so we are staying away from them as much as possible. The trip to the surface when hooked is often very stressful to them so we have given them a break until bigger ones (legal lengths) are here. Moving out to 600 plus feet as we have said before has been best and a live bait or two fished out the back as the focus there is on those Goldens on the bottom has produced some Mahi, and some of those elusive Sails are out in that deep water as well, but remember the numbers are down for late January here. The weather continues to be stellar and sea conditions are back to almost flat calm. Temps climbing into the mid70s in the afternoons. Warm for sure. Sunscreen and shorts today. Tight lines to you and hopefully good fishing from the crew @ Marlin MyDarlin.